Special offer for visitors from CAT PALACE USA! 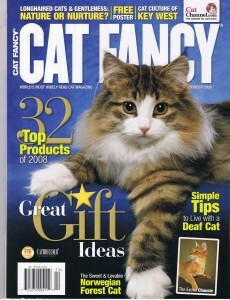 Order 1 year of Cat Fancy for only $15.00 and save 72% off the cover price! Cat lovers, you’ll find helpful articles galore in Cat Fancy. This magazine is devoted to helping you care for your cat features stories about health, training and grooming. Cat Fancy, for people interested in all phases of cat ownership, contains historical, medical, how-to, humor and first-person stories. I think Cat Fancy is a great magazine. It teaches good cat owners to become better ones, and teaches good cats to become wonderful cats. Cat Fancy contains important information about your cat, or any cat. For example, the pros and cons of getting your cat spayed/neutered, how you can tell if your cat is seriously sick as well as how to melt your cat by petting in your kitty’s favorite spot. This magazine is great for Cat lovers anywhere, anytime. Cat Fancy, written for cat lovers, is a wonderful diverse collection of articles on medical advice/concerns, heart-warming stories, traveling with pets, current issues (feral cats, behavoral problems, etc.) plus a monthly feature dedicated to a particular cat breed. In addition to its well-written and informative articles, there are exquisite photos. In the back, is an index of breeders and ads for feline related items. It truly is a cat lover’s magazine!